Fitness is definitely the new fad, and there are plenty of fitness devices out there. Some of them simply measure your steps. Others give you heart rate monitoring, and the higher spec ones even throw in GPS. Most of these come in the form of bands or pack in a watch to make it convenient to wear. Jabra, the company famous for their Bluetooth and audio devices, had other ideas. They have squeezed a heart rate monitor into their Sports Pulse headphones. Since most people already wear headphones of some sort while exercising, this kills two birds with one stone. We were sent the Jabra Sports Pulse Special Edition Wireless Headphones to try, so we gave them a spin! Jabra Sports Pulse features a biometric in-ear heart rate monitor, giving you precise feedback as you train. Compatible with Android or iOS via the Jabra Sport Life app. Built in inline microphone and music controls so you can listen to music or make and take phone calls. In many ways, they do not look unlike any other wireless headphones. You have the two earphones connected by a wire, and the right side contains a little control unit with three buttons on it. Two of them are for volume, and one is the ‘action’ key which can be used to turn them on or off, or other tasks. The left earphone has the Heart Rate sensor built into it, and needs to be in for that. The right earphone has a tab which can be displaced to expose a micro USB slot which can be used to charge this device. Both the earphones also have buttons on them which can be pressed during training to turn your training session on, or pause it. These are particularly handy for when you are training and have gloves on or just don’t want to reach for your phone in your pocket or bag. There are small LEDs on the inside of the earphones which are only really visible when you are not wearing these. They can tell you things like whether it is on or off, what the charge status is, and whether it is connected via Bluetooth or pairing, etc. The setup is fairly simple. You just turn these on and pair them via the Bluetooth settings on your phone. After that, you download the Jabra Sport Life app from your Android Play Store or iOS Market and open the app. The app then detects the device. You can enter a few details about yourself so it can assess your fitness levels. During our use, we got a notification on our phone screen that the firmware in the device wasn’t up to date. You needed to connect to a computer to get that update. Generally I ignore such messages as that often involves downloading and installing an extra software on your computer, and something that will only be used once or twice a year, if that. However, with these, all you had to do was download the required EXE file from their website, and then run it. No installs required. Just plug your Jabra headset into your computer via a micro USB cable and you’re good to go. Rather painless, so well done Jabra. A bit issue with exercising headphones is their fit, as well as any issues that they may have when being worn (i.e. them dropping out). The headphones come with a range of earphones as well as in-ear hooks. Chop and change them as you like to find your best fit. Once in, they definitely stay in, right till you try and hook them out. The Jabra website is full of tutorials on how to wear them, but if you have tried one set of such earphones, you know what you’re doing. It takes a little doing, but that is it. One important thing about sensing your heart rate is that the left earphone needs to be properly inserted, and has to provide a good fit. The sound offered by these is rather good. Slightly heavier on the bass, but it works well and provides good detail as well as overall sound balance. 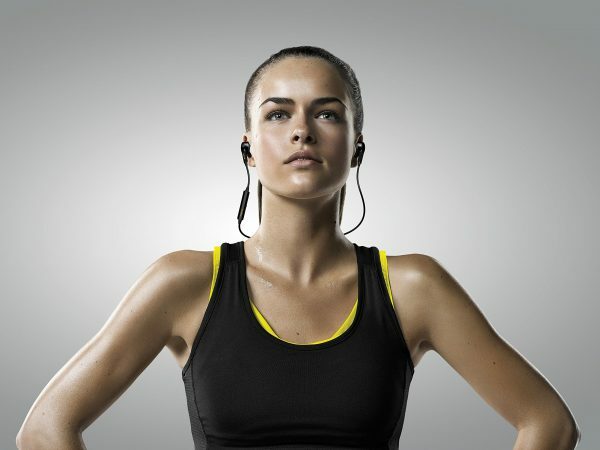 The headphones can be worn to listen to music even if you’re not exercising, as the quality is good enough. They do not offer a huge amount of sound isolation. For me, that is a good thing, as I like to be aware of what is going on around me while I am running or cycling. This may be different for others. Since this comes with its own, the device is only as good as what the app offers. Luckily, the app does offer a lot. 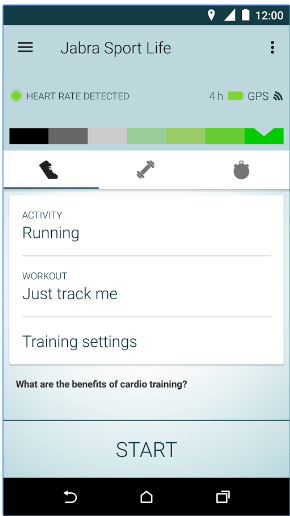 Your basic screen allows you to track various activities, be them running, cycling, walking, or a whole host of others including hiking, skiing, or even spinning or using a treadmill. You can set a ‘just track me’, or set a goal or target for yourself. You can also go and adjust your training settings which let you decide whether you want music or not, and if so, what app should handle it, what you want as a display and voice readouts, and whether you want your GPS to be on for your activities. Hit the dumbbell on the right and you can start logging your proper training work outs. and decide what kind of work out you are doing, be it CardiCore, MadCore, BellyBurn or many others. Each training work out comes with its own program, and instructional videos for you to see what you’re doing. This is great for people who want to work out in the comfort of their own home/nearby park but can’t fit a gym or a trainer into their lives. Once done, the app gives you various stats about your work out. A lot of detail is on offer, including splits, maps, graphs and heart rate zones. Whether the work out helped you improve or maintain your fitness is also included to help you. The app is great, but has some limitations. It does not offer Auto Pause like many others, which can be rather annoying for timekeeping if you are cycling on main roads and get stuck in traffic. It also doesn’t offer integration with the likes of Google Hit. There is no website on offer that tells you the data either. However, it does work with other apps such as Runtastic and Runkeeper. 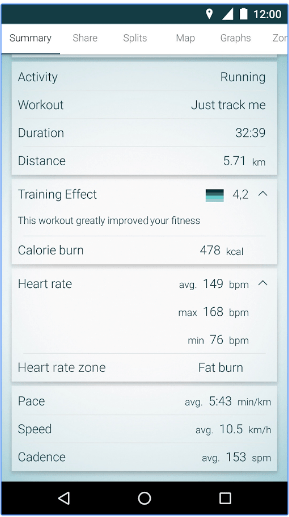 I found Runkeeper worked better than Runtastic, which was a bit of a hit and miss experience. In fact, it took me having to unpair and repair the device before Runtastic would even detect the headphones. It also struggles to measure heart rate when the screen turns off. Runkeeper didn’t show any of these issues, so I am thinking it is probably down to how well Runtastic works with other devices, and not just down to this devices. Since I do like the way Jabra app stores and tells you data, I preferred that. So, has my fitness improved due to these? A bit, definitely. I have worn these for a few weeks off and on, but this week I have worn them every day and cycled to work. This has meant that I have already done around 90 miles in the last 5 days, and will only add a few more today. If only Google knew how much I was exercising! To me this is probably the one major flaw these have to offer. The battery life of around 4 hours can be quite annoying as you will have to put these on charge quite a lot. More information on the Jabra Sports Pulse (Special Edition) Wireless Headphones can be found on the Jabra website. They are available from various online retailers, such as Amazon, where they are going for £109.99. At the new lower price on offer, these are a godsend for anybody who wants to take fitness and workouts seriously and can’t afford to do so in a gym.